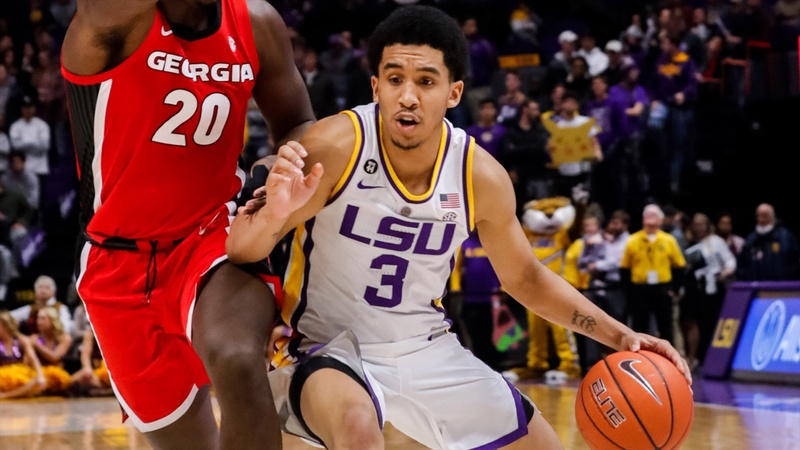 Tremont Waters scored a season-high 26 points as LSU moved to 5-0 in the Southeastern Conference by defeating Georgia 92-82 at the PMAC on Wednesday night. The turning point of the game came early in the first half. With the Tigers trailing 13-8, Waters started a 14-0 run with a field goal and a 3-pointer. Ja’vonte Smart knocked down a 3-pointer to give LSU the lead for good at 16-13. Marlon Taylor added two foul shots and Smart connected on a short jumper. A dunk by Taylor gave the Tigers a 22-13 lead with 12:07 before halftime. Led by Skylar Mays’ 12 points, LSU extended its advantage to 12 points at 48-36 heading into halftime. Georgia trailed by no fewer than six points during the second half – that coming with more than 18 minutes to play. Waters continued his outstanding play since returning to the starting lineup in the Tigers’ final non-conference game against Louisiana-Monroe. Waters was 9-of-14 from the field and 7-of-11 at the foul line. The nine field goals were a season-high for Waters. He had a hand in 13 straight points as LSU extended its lead from seven points to 12 points during the final 4½ minutes. During that stretch, Waters scored 10 points and had an assist which resulted in a three-point play by Kavell Bigby-Williams. Waters had four assists and four steals with no turnovers in 32 minutes. The 26 points were the fourth most scored by Waters against a SEC opponent in his career. In the last six games, Waters is averaging 17.5 points and 7.8 assists. LSU’s starting lineup consisted of Bigby-Williams and Reid in the post, Mays and Taylor on the wings and Waters at point guard. Bigby-Williams only played 14 minutes. Three starters were on the floor for more than 30 minutes – Taylor (33), Waters (32) and Mays (31). . .Mays came out of his shooting slump as he made more than 50 percent of his field goal attempts for the first time in a SEC game. Mays was 5-of-9 from the field and a perfect 8-of-8 at the foul line. Mays was 13-of-38 from the field in the four previous conference games. The eight made free throws were a season-high. Mays’ 20 points matched his season-best. He also scored 20 points in LSU’s loss to Oklahoma State. . .Reid had a good night except for his five turnovers. He was 7-of-11 from the field and made his lone 3-point shot. Reid had three blocks and two steals to go along with his seven rebounds. . .Smart had another rough night shooting the ball as he was 4-of-14 from the field, including 1-of-6 on 3-pointers. Smart is shooting 29 percent from the field (27-of-92) over the last nine games. . .No other LSU player scored more than six points. Bigby-Williams had six points and one rebound in his 14 minutes. Williams was on the floor for only 17 minutes. Taylor had six points and four rebounds, while Darius Days had three points and four rebounds. . .Georgia pulled to within six points at 50-44 less than two minutes into the second half. The Tigers answered with a 12-2 run to move comfortably ahead. Reid had three baskets in that stretch. The other six points came on field goals by Waters, Mays and Williams. . .LSU has won 18 straight home games which matches the second longest in the history of the PMAC. The Tigers won 18 consecutive home games during the 1983-84 and 1984-85 seasons and the 1989-90 and 1990-91 seasons. . .LSU has won eight straight games for the first time in four seasons. The Tigers also had an eight-game winning streak during the 2014-15 campaign. . .LSU has won five straight SEC games for the first time since it put together a ten-game league winning streak in 2009. . .The Tigers are 15-3 overall, 5-0 in the SEC. LSU is one-half game behind Tennessee, which beat Vanderbilt in overtime Wednesday to go to 6-0 in the conference. The Tigers have won their first five conference games for just the third time in 50 seasons. LSU won its first 17 SEC games in 1981 and its first seven league games in 2006. Both of those teams won the conference title and advanced to the Final Four. . .Georgia is 9-9 overall, 1-5 in the SEC. All five of the Bulldogs’ league defeats have been by double digits. . .The paid attendance was 9,416. The actual crowd was about 6,600. LSU will play Missouri at Mizzou Arena in Columbia on Saturday. Tipoff is scheduled for 5 p.m. Central. Missouri (10-6, 1-3) played Arkansas in Fayetteville on Wednesday night. The LSU-Missouri game will be available on the SEC Network.